Thorsten Hofmann, Managing Director of ECCO Berlin | Advice Partners and head of the Institute for Crisis, Change and Conflict Communication C4, reflects in his latest blog entry on negotiations that are increasingly conducted by email and discusses whether digital negotiations really improve the chances of success. Read the full article “Tripping hazard or magic bullet? 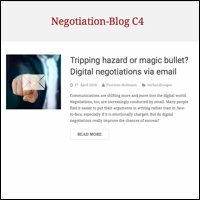 Digital negotiations via email” on his negotiation-blog.eu. Thorsten Hofmann, head of the Institute for Crisis, Change and Conflict Communication C4, explains what we can learn for our professional life from everyday negotiation situations. Social media in Swiss companies 2018. The Bernet ZHAW study shows more and more experience, resources and a strategic view. Too often, social media applications are limited to projects or departments. 9 out of 10 companies are active in the social web. Quantitative growth is decelerating at a high level. An overview of the results of our latest social media study.